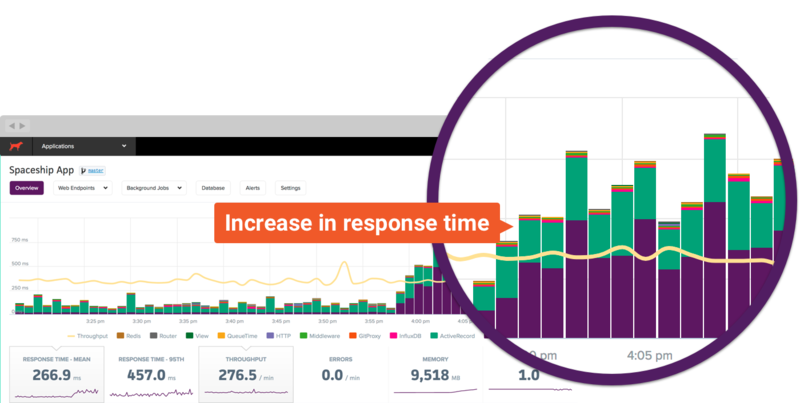 Scout saves you time when investigating performance outliers vs. legacy APM tools. See how in this everyday use case ⤵. Q: Is this impacting every web endpoint? Or just one? Just click-and-drag on the chart. Scout analyzes your endpoints, identifying the performance outliers. A: There's only one endpoint that mirrors the spike in response time. You have to to navigate to the "transactions" area, click on each transaction, and identify which endpoints match the trend. This can be a laborious process. Q: Are all requests to this endpoint slow? Or are there some extreme outliers? A: There are some extremely slow requests. It's harder to identify the cause of large response time distributions as only traces for slow requests are captured. 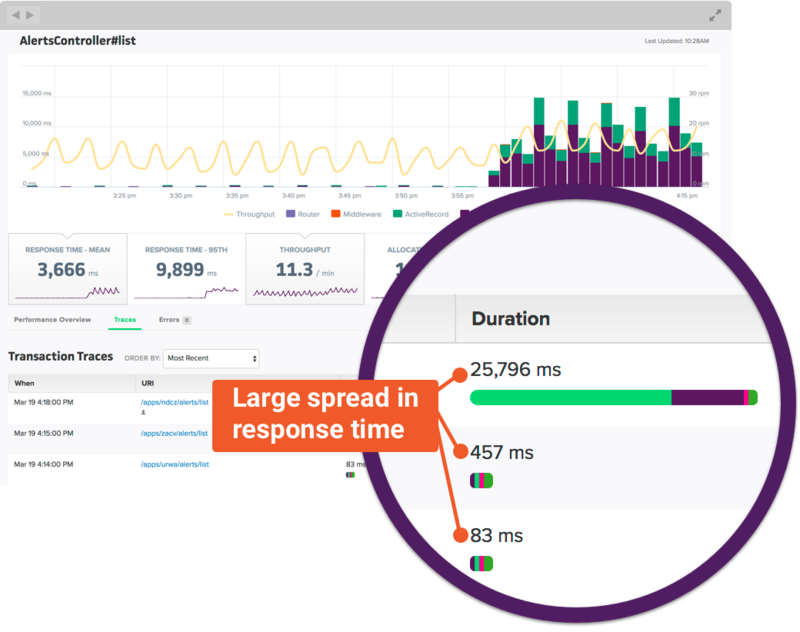 Identify the common traits of slow requests with crossfilter, Scout's realtime context-reducing powerhouse. A: All of the slow requests share the same request path and current user. You can't explore and filter transaction traces (and certainly not in realtime). Q: What area of code is responsible for this bottleneck? Identify bottlenecks in your application code without adding custom instrumentation. ScoutProf, our production-safe profiler, augments our default instrumentation and profiles your custom code. A: Most of the time spent was spent iterating over a large Array. There's no profiling of custom code. Q: Who's the best person to fix this? Backtraces are overlayed with git blame output, making it easy to contact the developer that knows about the problem area. A: Let's talk to Derek 😉. You'll need to open your code editor, inspect the source, then ask around for the developer that might know about this area of the code. We've quickly identified the problem endpoint, the conditions that trigger the slow requests, the custom code relevant to this bottleneck, and the git commit associated with the code. This is just a taste of Scout. There are many more reasons your peers at Plex, CloudApp, SWSX, and more have switched to Scout, the new New Relic alternative. Get your time back - start a trial today and see Scout's low-overhead monitoring on your own app.